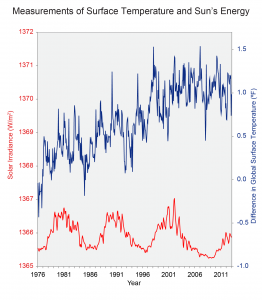 Climate Communication | How do we know recent warming is NOT caused by the Sun? Home | What	`s New | Common Climate Questions | How do we know recent warming is NOT caused by the Sun? Q: How do we know recent warming is NOT caused by the Sun? A: Scientists have been measuring the amount of the Sun’s energy reaching the top of Earth’s atmosphere using sensors on satellites since 1978. Since that time, global temperatures have risen sharply, while there has been no trend in the amount of the Sun’s energy reaching Earth. In addition, if the warming had been caused by an increase in the Sun’s energy, we would expect to see warming throughout the layers of the atmosphere, from the surface all the way up through the stratosphere. On the other hand, warming caused by a build up of heat-trapping gases from human activities would cause warming at the surface but cooling in the stratosphere, and this is in fact what we observe. Learn more about why natural factors, like the Sun, can not explain recent warming.